Up for sale is a beautiful pair of B&W Nautilus 803 speakers in excellent working condition. They sound musical, delicate and coherent with airy highs, intimate mids and punchy bass. Upgraded jumper wires will be included. Single Speaker As Shown. All of our inventory is new and unused unless otherwise noted. 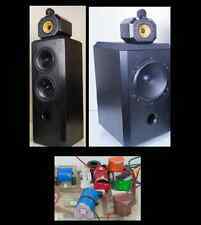 I think it fitsB&W Matrix 803, 804, 805, HTM Speakers. DC resistance is 5.1 ohm. The tweeter works great; as it is supposed to. A rare opportunity to give new life to your B&W Matrix 803, 804, 805, HTM Speakers. The speakers are in good shape. Tested and sound great. Some scuffs and marks on wood from use and storage. All speakers are in great condition free of any tears or damage. Please see photos below for further detail. Includes everything shown in photos. Feel free to ask any questions. Speakers are in excellent condition! Speakers tested and work great! More about the speakers Frequency range. Depth: 498mm. Width: 334mm. Height: 1160mm (not including feet). 8Ω (minimum 3.0Ω). Matrix 801, 802, 803, 804. Every aspect of their already impressive performance is enhanced and the quality of music moves one closer to the ideal the 801 is capable of producing. This upgrade will bring you closer to the music, well done upgrade that breathes new life into the venerable 801 matrix.". "Im very happy! The untouched speaker sounds more and more radioshack in comparison. There is a very nice easiness and neutrality in the tones. It plays classical, jazz, old and new pop, and louder guitar material very well like it should.". B&W original Nautilus speaker spikes, set of 4. Includes 4 spikes per QTY1 and lock nuts only. Spike feet for Nautilus, Diamond 803, 804, 805 Nautilus parts M6 thread also fits JM Lab / Focal speakers and many more. Mid Range Driver. Only 1 available. Tweeter grille for Nautilus 805S, 804S, 803S only. Does not fit D, Diamond, Nautilus (not S) or Matrix series. B&W Bowers & Wilkins Nautilus 803 and 804 Original Owner's Manual as pictured. Part Number ZZ10531. FST Midrange Driver. Nautilus 803 804. Bowers & Wilkins (B&W) Nautilus 803 Floorstanding Speakers in Red Cherrywood. Condition is Used. Item is in great condition, has few minor scratches. Like all of their dedicated bass-only drivers, the basic rigidity of the radiating area is enhanced by our novel 'mushroom' construction, a girder-like component that supports the central area of the dustcap. Includes manual, cleaning wipe, spikes and rubber feet. Does not include jumpers. [Used pretty rare serial number speaker pair] B & W Nautilus 803. Middle East. Scratches on the bottom are conspicuous. Ordering More than 1 item??. base woofer for 802, this has previously been repaired due to tinsel wire snapping. FITS ON MATRIX 803 803 S2 804 805 HTM. NEW PAIR IN BLACK COLOUR ORIGINAL PARTS. ALSO AVAILABLE ARE THESE PARTS. ZZ03328 ZZ11452 ZZ13307 ZZ14036 ZZ11940 ZZ08915 ZZ12483 ZZ12912 ZZ03328 ZZ06513. I included close up photos to see condition of logo badges. ZZ05475 ZZ12920 ZZ09929 ZZ12849 ZZ05109. ZZ03328 ZZ11452 ZZ13307 ZZ14036 ZZ11940 ZZ08915 ZZ12483 ZZ12912 ZZ03328 ZZ06513. ZZ00221 ZZ12831 ZZ003720 ZZ06513 ZZ10847 ZZ03720 ZZ09776 ZZ13323 ZZ02771 ZZ05475.